Toe to Toe Disclaimer: This “Toe to Toe” series is not about arguing that one text is better than another; instead, it is about the battle that plays out between texts every semester as we are forced to cut or change out readings because there just aren’t enough days in the semester to read and discuss everything we think should be in the course. So we ask ourselves: What are the main themes I will be addressing this go around? Which texts will help my students and my courses achieve their goals? And, we ask our texts, why do you belong on my syllabus? Ethnic American literatures have always been particularly appealing to me as a reader and a teacher. I was struck with a very intense I-want-more-of-this feeling when I began reading Iranian American literature. It is a growing area with women writers, such as Donia Bijan, Anita Amirrezvani, and Persis Karim, authoring novels and editing collections of Iranian American poetry, short stories, and essays. I still find myself, however, turning very purposefully to the memoir genre when constructing my American literature and Women’s and Gender Studies’ syllabi. In the fast paced survey courses or the survey like introductory courses, the decision to devote 2 weeks to a longer text—whether it is a novel, a memoir, or an entire collection of poetry—is a big decision. I tend to teach multiple lengthy texts in these types of courses, so I intensely scrutinize my picks. 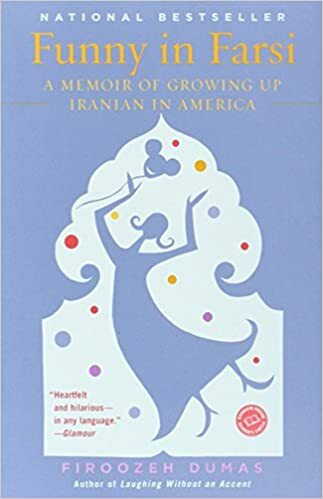 I move back and forth between Firoozeh Dumas’s Funny in Farsi and Azadeh Moaveni’s Lipstick Jihad, but I remain with Iranian American memoir because of the immediateness of US relations with Iran and other Middle Eastern countries. I utilize these memoirs to introduce students to Iranian culture and the experiences of Iranian American immigrants in the U.S. I find that students know a few key terms, but for the most part, they are unfamiliar with Iranian history and culture. The informative elements of Dumas and Moaveni’s texts are drastically different, which is why I reassess the benefits and limits of each text every semester I teach one. 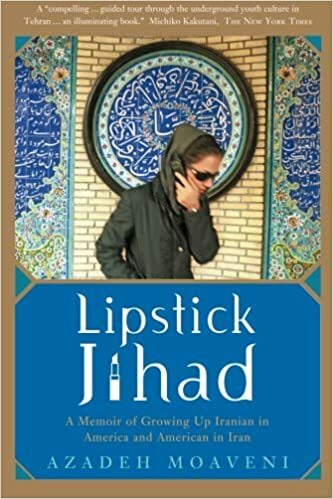 Funny in Farsi and Lipstick Jihad could both fit as easily in a world literature classroom as in an American literature classroom. This is one of their main appeals. Both authors move the focus of the text in and out of US borders, presenting a global experience of American immigrants. 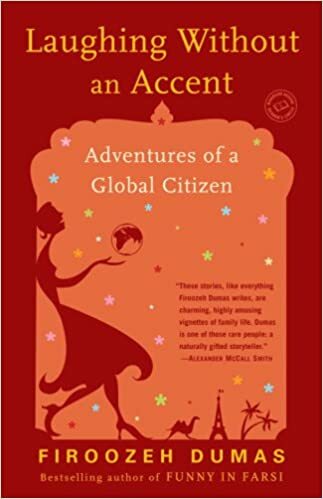 Dumas recounts her experiences as an immigrant from Iran as a child with family visiting from Iran and her own family vacations back to Iran, while Moaveni depicts her life as the American born child of Iranian immigrants who eventually returns to Iran as an American journalist. The majority of Funny in Farsi occurs within the United States. There are accounts of family members visiting from Iran and Dumas visiting Iran on family vacations. It spotlights the process of becoming an American and America’s resistance to immigrants. Lipstick Jihad, on the other hand, primarily addresses the experience of an Iranian American living in Iran. Moaveni depicts her attempt to leave her American identity behind and become Iranian. From a regional perspective, if I want a text where the majority of it occurs on US soil, Funny in Farsi is my choice. Conversly, if I want a text that considers the experience of an American abroad, then I go with Lipstick Jihad. The semester I organized my American literature course by genre, I taught Funny in Farsi because of Dumas’s use of the vignette form. Moving from the sermon to the captivity narrative to the autobiography to the speech to the slave narrative to the personal essay to the memoir, I wanted students to see the stark differences and overlapping formulas present in non-fiction texts. This was extremely effective. Students were able to have a more complex discussion of the vignette form because they could critically compare it to a wide variety of other non-fiction forms. However, one drawback is that students become exhausted with the form and ready to move on by the final day. Students begin voicing frustration with the thematic repetitiveness of it, which does add another layer to our discussion of the form. Moaveni’s writing style, at times, reflects her career as a journalist. Many chapters are diligently and beautifully crafted, while others offer a clear, straightforward representation of information and events. The stark difference in writing style from chapter to chapter is a strength of the text when teaching it. Some students are onboard with her memoir from start to finish, but others shift back and forth depending on their interest in either the emotional, personal drama or the historical facts. Those who were drawn in by her reflections on her family and childhood in chapter one become overwhelmed by her explanation of politics, history, and international custom procedures in chapters two and three, and those who weren’t interested in her childhood can’t stop talking about the politics and history. Unlike Dumas’s vignette form, Moaveni’s chapters each bring up a distinct issue that relates to the broader conceptualization of identity and the search for a home. Each memoir involves a clear shift in American attitudes towards people of Middle Eastern descent. While the women are only ten years apart age-wise, there are some stark distinctions based on generational experience. The moments that each woman finds most crucial makes their age difference feel much further apart than is the case. In one section of Funny in Farsi, perhaps the most solemn of them all, Dumas outlines her and her father showing up in support of America during the Iranian Hostage Crisis. She acknowledges a change in her experience as an Iranian American following the events of 1979-1981. Many students are unfamiliar with the political history between the US and Iran, so her childhood experience opens up that space for discussion. I take my students through a timeline of the US and Iran’s interactions; I provide much of the information, but they also contribute by adding events referenced in the text. This element of the memoir divides her Iranian American experience into pre- and post-Iranian Hostage Crisis. Likewise, my students and I build a timeline from Lipstick Jihad, but the majority of it comes from Moaveni’s own accounts with much less supplementing from my end. Moaveni’s big event comes in the final chapter of the text when she recounts her experience on September 11, 2001. As a journalist in the Middle East, this becomes the most pivotal moment in her story. Her entire future and ability to physically move between countries comes into question. She also reflects on her and her friends’ reactions in the days following 9/11, trying to understand the response to the events in different parts of the world. Comedy is right there in the title, actually in both titles. Funny in Farsi delivers on the funny with laugh out loud moments and references to American popular culture galore. The humor is fueled by miscommunication, awkward childhood moments, and references to America’s beloved game shows and icons. The power of humor is a discussion I frequently have with my students across my courses. There are many moments in Dumas’s memoir that, despite the use of humor, are quite upsetting. To what extent does using humor to frame her experience of putting a “non-ethnic” name on her resume in order to get actually get a job interview address the severity of that experience? Does humor make the issues too easy for readers to ignore? Lipstick Jihad has lighthearted chapter titles that are very funny to go along with the book’s title. The contents of those chapters, however, are not lighthearted. The title of the book reflects the small acts by Iranian women that signal a revolution. The humor of her titles is really in their cleverness. She presents her own struggles and those of other Iranians alongside the privileges that many of them experience, whether based on age, gender, class, nationality, or employment. The seriousness with which she approaches her memoir is by no means depressing; perhaps the level of intensity is what is increased. Dumas’s Laughing Without an Accent and Moaveni’s Honeymoon in Tehran both open with reflections on the publications of their first memoirs. Dumas recounts the difficulties she had in trying to control who translated her book and then the cultural limits of certain jokes. 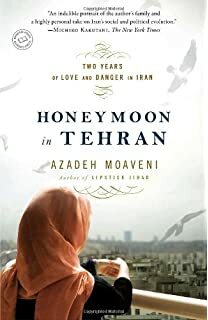 Moaveni expresses her anxieties about returning to Iran after her critical treatment of the Iranian government in her first book. While I have not brought these first chapters into the classroom yet, I can see my own students being very interested in these commentaries. The writers consider some of the practical implications of memoir. For Dumas, it is the loss of her family’s anonymity despite her attempts to hide their identity. And for Moaveni, there is a real sense of danger as an outcome of her writing. I have taught Funny in Farsi. I have taught Lipstick Jihad. I have taught Lipstick Jihad with excerpts from Funny in Farsi. It actually wouldn’t be that difficult to teach some excerpts from Lipstick Jihad either. Students have embraced it all and really absorbed as much information as they could about a culture that they really had limited knowledge of and very little exposure to.